He has promised to withdraw from the Paris Agreement, bring coal mines back online and has said he supports fracking. But what will Donald Trump’s presidency actually mean for global climate action and the future of our planet? Here are 5 things that will influence how it plays out. The President-elect has said he will ‘cancel’ the agreement within his first 100 days. Under the terms of the agreement, any country that has ratified it must wait 3 years before filing notice that they will withdraw, which then triggers an additional 1 year waiting period. His first term will be finished by then. However, the Paris Agreement sits on top of a broader treaty – the United Nations Framework Convention on Climate Change – which entered into force 22 years ago. Trump could withdraw the US from this treaty, which would end US involvement in the Paris Agreement. This is an aggressive option and may lead to diplomatic blowback in other fora – including those where he has said he will negotiate a better deal for Americans. If the US pulls out of the Paris Agreement (or just ignores its commitments), the agreement will still remain in place. It is legally binding as long as 55 countries representing at least 55% of global emissions ratify it. Already, 103 countries representing 73.38% of global emissions have ratified . Removing the US’s 17.89% will make a major dent, but the 55% threshold for ratification will still be met. The Agreement was also structured in a "bottom-up" manner, meaning each country voluntarily pledged its own emissions reductions as part of the agreement. These pledges remain intact even if one country pulls out and many countries – including China, India, and Brazil – are pushing ahead with their own action because they recognize it is in their own national interests. For many it is a matter of air quality, health, and economic development, not just climate. The President-elect has picked Myron Ebell to lead his transition team for the Environmental Protection Agency (EPA). Mr Ebell is a "climate skeptic" who has widely questioned climate change "alarmism". The transition arrangements will be interesting because Mr Ebell has described the EPA’s Clean Power Act as illegal and Trump himself has described the EPA as a ‘disgrace’ and one of the departments he might cut. The Department of Energy transition team will likely be led by Mike McKenna, who has worked for the department before and also lobbied on behalf of oil and gas companies and Koch Industries. Trump has said he will bring coal mines back online and that he supports fracking. This has generated optimism in communities where these industries seemed to be in decline. However, an early challenge he will face is that in the US, the main competitor of coal-fired electricity is not renewables, it is electricity generated with natural gas. They each represented 33% of US electricity generation in 2015 . In terms of jobs, the US solar power industry is estimated to employ around 209,000 people , while oil and gas extraction and refining employed around 285,000 people. Meanwhile, coal-fired power is estimated to employ around 60,000 people. With solar power representing just 1% of total US electricity generation, there is immense upside growth potential. 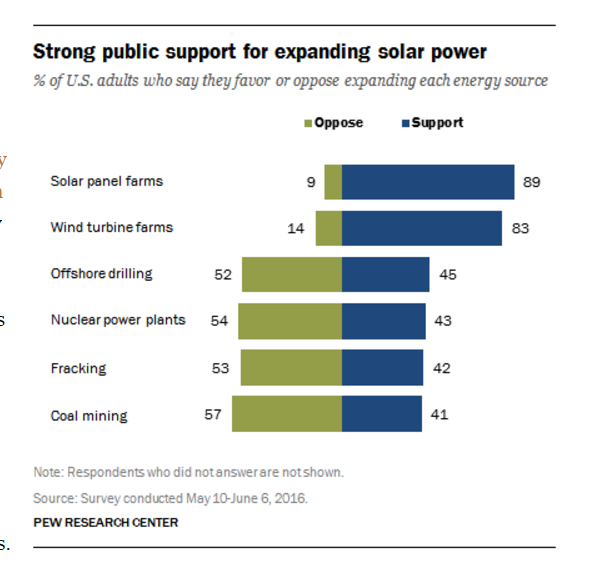 Amidst falling costs, renewable energy is also very popular with the US electorate. It is perhaps unsurprising that the International Energy Agency recently reported there is now more renewable power generation capacity in the world than there is coal-fired power capacity. They also forecast the cost of solar to fall by another 25% over the next 5 years. CERES and Bloomberg New Energy Finance have forecast that renewable energy represents a $12.1 trillion investment opportunity in the US. Perhaps most importantly, a study has shown that a relatively minor investment in retraining would allow most coal workers to transition to the solar power industry. In short, the decision to invest in renewables is not just an environmental decision, it is an economic one. As a businessman, the President-elect should be able to recognise good economic opportunities when he sees them. While building momentum for action, symbolism matters. It was very important up to the point of ratification of the Paris Agreement. It is less clear how important it will be going forward or whether globally we’ve reached a tipping point for climate action. For example, strong signals have been sent through 2015 and 2016 and markets are moving. The green bond market rose from $42 billion in 2015 to $65.4 billion already this year and global investment in renewable energy capacity in 2015 was $266 billion, more than double the allocations to new coal and gas capacity. A crucial element of the process that developed the Paris Agreement was the active and substantial involvement of the private sector , city and state governments, and civil society. These stakeholders not only supported action in a general symbolic sense, many also committed to real actions themselves. This buy-in was crucial because it will be businesses, cities, and communities that will need to implement climate action on the ground. Within the US, state and city governments will play an important policy role. Five of the 10 US states with the highest greenhouse gas emissions have emission reduction targets in place. A number also have state-wide carbon prices (or are exploring them). Meanwhile, many cities want affordable, clean energy and zero air pollution for their residents and are developing policies to achieve this – e.g. incentives for electric vehicles. Climate change was never a problem that national governments could solve on their own. When it comes to climate action we were already seeing a shift away from top-down multilateral agreements and towards collective action by diverse groups of stakeholders (increasingly including the private sector and investors). A Trump presidency may accelerate that shift – either because such a philosophy of ‘devolved power’ is consistent with Republican ideals, or simply because other stakeholders will find ways to press ahead with climate action regardless of his policies. There are three branches of government in the US – the legislature (the House of Representatives and the Senate), the executive (the President and around 5 million public servants), and the judiciary (the courts). The signs are that all three will feature heavily in climate policies in the next 4 years. Environmental groups in the US have already indicated their likely strategy in the coming years may be similar to those deployed when George W. Bush was president – namely localized action and grass roots mobilization. This has included legal action and they will be buoyed by recent court actions in the US and globally. The UK is being sued for failing to deal with a ‘national air pollution crisis’, the Netherlands has been ordered by a court to cut its emissions, and Norway is being sued over arctic drilling plans. In the US, a group of teenagers has challenged the US Government for not protecting them from climate change. The US EPA’s current Clean Power Plan was also challenged in court – coal miners, some labour unions, and 27 states are leading the challenge while the renewable energy industry, leading tech firms, and 18 states are supporting the EPA’s legislation. Attempts to scrap the plan may also take some time. Make no mistake, there is a lot at stake when it comes to addressing climate change. The five warmest years on record have been 2011-2015 and 2016 is expected to be warmer still . Continuing to emit greenhouse gases at current rates could cost investors $2.5 trillion and if emissions get worse the risk goes up to $25 trillion. It is no wonder it has consistently been one of the top risks identified in the Global Risk Report during the last 5 years. It was also the top issue identified in a survey this year of 25,000 young people. What remains to be seen is whether one person can destroy the collective efforts of millions of stakeholders across the planet or not. The answer may have as much to do with each of those stakeholders as it does with the new President-elect of the United States.